Tyler Cowen (reference below, video on right), describes the way markets link over time through the actions of speculators and mechanisms such as futures markets. 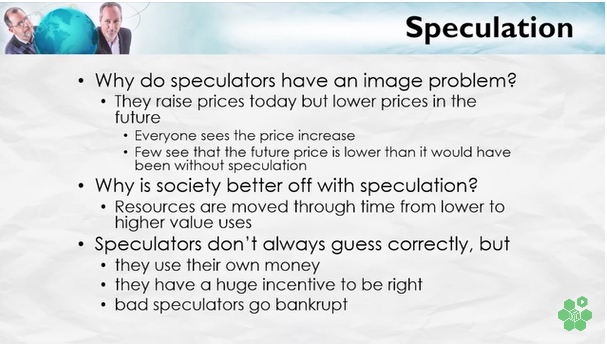 Speculators take resources from where they have low value and move them through time to where they have high value. The increase in welfare is illustrated by the fact that today’s loss in value due to speculators taking supply out of the market (red area) is smaller than the future gain in value when speculators bring the supply back on the market (green area). It also tends to smoothen prices. Speculators do not actually have to physically take supply off the market (through, for example, buying and storing the commodity) and then physically put it back on the market (taking it out of storage and selling it). They can use Futures – contracts to buy or sell specified quantities of a commodity or financial instrument in the future at a price agreed upon today. From http://www.mruniversity.com/node/192287, accessed 1 May 2016. Sometimes speculators get it wrong. In the months before the Persian Gulf War, speculators drove up the price of oil: The average price in October 1990 was $36 per barrel, more than double its price in 1988. Oil speculators, like many people around the world, expected the Gulf War to last for months, disrupting the oil supply throughout the Gulf region. Thus, speculators either bought oil on the open market (almost always at the high speculative price) or they already owned oil and kept it in storage. Either way, their plan was the same: to sell it in the future, when prices might even be higher. As it turned out, the war was swift: After one month of massive aerial bombardment of Iraqi troops and a 100-hour ground war, then President George H. W. Bush declared a cessation of hostilities. Despite the fact that Saddam Hussein set fire to many of Kuwait’s oil fields, the price of oil plummeted to about $20 per barrel, a price at which it remained for years. How much money did speculators lose or make on each barrel? Speculators made a profit of $16 per barrel. Speculators lost $16 per barrel. Most oil speculators broke even. When speculators sold their stored oil in the months after the war, did this massive resale tend to increase the price of oil or decrease it? The resale increased the price of oil. The resale decreased the price of oil. In 1980, University of Maryland, Julian Simon bet Stanford entomologist Paul Ehrlich that the price of any five metals of Ehrlich’s choosing would fall over 10 years. Ehrlich believed that resources would become scarcer over time as the population grew, while Simon believed that people would find good substitutes, just as earlier people developed iron as a substitute for scarce bronze. The price of all five metals that Ehrlich chose (nickel, tin, tungsten, chromium, and copper) fell over the next 10 years and Simon won the bet. Ehrlich, an honorable man, sent a check in the appropriate amount to Simon. What does the falling price tell us about the relative scarcity of these metals? The falling price indicates that the metals are scarcer than what they were before. The falling price indicates that the metals are less scarce than what they were before. The falling price tells us nothing about scarcity. Which of the following could not have caused the shift? Scientists developed substitutes for the minerals. The demand for the minerals increased. The supply of the minerals increased. 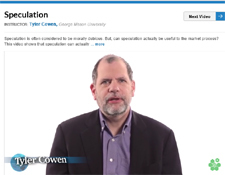 Tyler Cowen, Speculation (11-minute video), Principles of Economics – Microeconomics, Marginal Revolution University, at http://www.mruniversity.com/courses/principles-economics-microeconomics/speculation-oil-futures-market, accessed 1 May 2016. 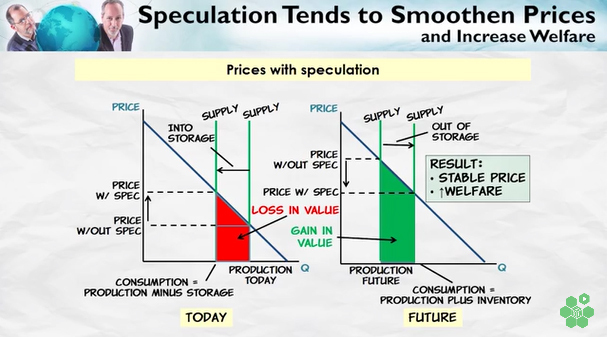 Image: Tyler Cowen, minute 1:14 of Speculation (11-minute video), Principles of Economics – Microeconomics, Marginal Revolution University, at http://www.mruniversity.com/courses/principles-economics-microeconomics/speculation-oil-futures-market, accessed 1 May 2016.